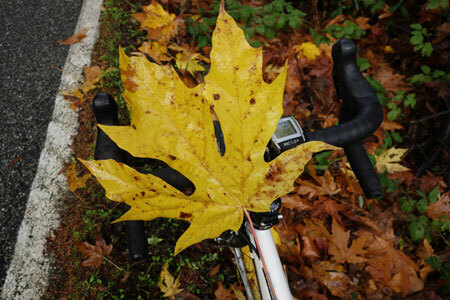 Broadleaf maple hitches a ride on my handlebars. One wonders what it is about the Broadleaf maple that makes it have such big leaves? Is it genetically gifted? Or is it just being a show-off? This leads me to a somewhat tenuous segue into the world of legal stimulants and whether or not they’re dangerous. Maybe so. The popular 5-Hour Energy drink has come under suspicion as some 13 people have died from taking the drink and 33 were hospitalized over the last four years. It could be a statistical coincidence, or there could be some validity. While professional athletes will stop at almost nothing to get the winning edge, even weekend warriors have a compulsion to try all kinds of energy foods and drinks. I’ve eaten a yummy and easily digested gummy with caffeine and I’ve got to say I felt a difference. I rode stronger and felt better. I wish I could feel that way just by eating a bowl of steel-cut oats, but I can’t. I know because I eat oats all the time. You shouldn’t be worried about taking something that’s the equivalent of a cup or two of coffee, but beyond that there could be complications. As with all quick fixes in life, there are usually negative effects in the long run or I should say, the long ride. 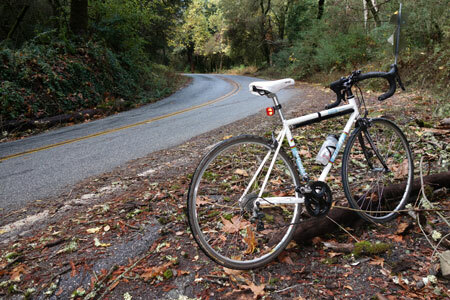 As you’re riding up Redwood Gulch Road, just remember this photo. It looks so flat. This entry was posted on November 18, 2012 at 2:45 pm and is filed under News. You can follow any responses to this entry through the RSS 2.0 feed. You can leave a response, or trackback from your own site. It is interesting that you wrote about this. I’ve been grousing to my riding buddies lately about the proliferation of energy drinks (legal speed). On one hand I respect the rights of people to consume what they want responsibly but too many people are drinking too much of the many stimulant drinks out there. I choose to single out RedBull as the prime offender because they have such a high profile. The X-treme events they sponsor may be fun to watch in a sadistic/voyeuristic way but they are largely stupid and dangerous. I think all the energy products are way too easily and often over-consumed. As cyclists we see evidence constantly in traffic where they dive too fast and out on the trails where there seems to be a race for the biggest air. I say, if you are tired, rest. And always be polite.